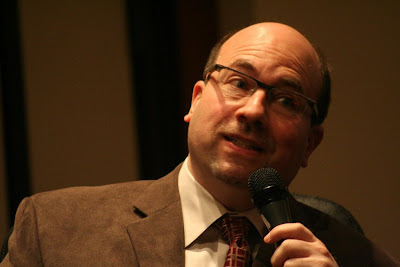 Just had a good conversation this morning with Craig Newmark of Craigslist and the Craigslist Foundation. There are two hot issue right now on Craig's social action radar, the new launch of the All For Good website and next weekend's Craigslist Foundation Boot Camp in Berkeley. Q: Do you consider yourself a social entrepreneur? A: No, I don't think of myself that way. I may be one, but it seems to have too many syllables. I think of myself as a nerd. Q: Tell me about the balance between the two bottom lines of Craigslist as a social enterprise. A: We are wholly driven by our community. We ask them what they want and need, and then we do it the best we can. Then we go back and ask again. Jim [Buckmaster] runs the business. I was influenced back in 1976, when I was considering a job with IBM, by reading a quote from TJ Watson (Sr or Jr) about how if you took care of the customer, the business takes care of itself. Q: Do you have explicit choices to make trading off the two bottom lines? A: No, it more sorts of rolls along from our approach [focusing on the community]. We know that we're not maximizing our profits by sticking to our focus. Q: You're just announcing All For Good: what's the goal? A: There are a lot of people these days who want to help other people out. All for Good makes that easy. The President is focusing on service. Q: What's the connection to Craigslist? A: All for Good's spirit is the spirit of Craigslist. Simplicity. People working with each other. Q: What's the difference between All for Good and other service websites like VolunteerMatch, Network for Good and Obama's Serve.gov? A: More will be revealed. These sites should be working together using technology like RSS feeds. And All for Good does draw on feeds from other sites. We're all in this together in service. If we’re serious about service, we’ll work together. Q: What's your linkage to service? A: Well, I'm going to stick to customer service! Other people are good at other things. For example, you can see that Arianna Huffington is much better at writing in her post:"All for Good: A New 'Craigslist for Service'"! I'm not going to quit my day job in customer service. There are different variations of public service. Customer service is a form of public service. Customer service is done with good will and in conscience. Q: What are the top three forms of service you're trying to promote? Q: Do you have a strategy or roadmap for these social actions that you’re following for Craigslist or yourself personally? A: These aren't Craigslist projects: they are me acting as an individual, and/or the Craigslist Foundation. Things are changing in our country with a new civic engagement. I think of people under 30 as the new civic generation, much like the GI generation. People like me help get the word out. We need ways to make it easy, ways like All for Good. Q: What things are you working on? A: For me specifically, government and social media (and not just Washington), social media, the Sunlight Foundation ( on government accountability and transparency, data.gov, etc.) Also working with Iraq and Afghanistan Veterans of America to help get them the respect and services they deserve, working on reform of the VA. I also want to mention Consumer Reports. They help us all with refrigerator reviews and the like, but they are also in the vanguard of health care reform. Q: Many people in the tech field want more meaning and more social impact for their lives. What is your advice about what they should do and how they should go about doing it? A: Get involved, All for Good makes that easy. Q: What’s your advice to them on going local vs. national vs. global? A: Think globally, act locally is the cliche, but there's a lot to it. Of course, people dedicate their lives to service in many ways, joining the armed forces or the Peace Corps, becoming teachers, firemen, policeman. That's by no means as exhaustive list, but a big deal for me to support people who serve. Q: Are there things that techies can specifically do better? A: Nerds can help. They can build technology like All for Good, that help people connect. Help build tools that allow us to look into government. Q: Do you have suggestions or advice to the tech billionaires about deploying their personal fortunes? A: I don’t presume to tell them to do with their money. But it is worth mentioning that Steve and Jean Case (of AOL) are doing some great things. A: Looking forward to seeing people next week at the Bootcamp! P.S. take care, anyways! D.
Great question from previous post. I've also seen this All For Good concept described as a "Craigslist for Service," a metaphor from the presidential campaign which Craig has really help popularize and spread. But actually I don't see Craigslist aggregating other bulletin board services, so I'm not sure what "to Craigslist" something really means. To my mind, the big advantage Craigslist.org had was that it was first in the space -- aside from that I fail to see any real innovation there. It's not even non-commercial anymore (hasn't been for years). Furthermore, Craig and his team had more than a DECADE to make Craigslist.org more useful for volunteer recruitment and search and they never did anything with that opportunity. I suppose the chance to be in the Obama sunlight changes things?